BitFenix introduces the Enso Mesh, a new steel mid-tower with a tempered glass side panel and fancy RGB LED effects. This model can be found for 89.90EUR, it's offered in black and white versions. The ENSO MESH is the latest addition to ENSO chassis series. ENSO MESH not only presents BitFenix simple beauty PC concept with the latest AURA SYNC 3 pin addressable RGB LED technology and also offers the best cooling performance with its High density mesh front design. The core of the ENSO MESH is its clean design, well balanced between a perfectly organized interior structure and the sleek exterior design. It is complemented by a tempered glass side panel and the latest in RGB illumination effects, highlighting the clean and discreet lines of the High density mesh front panel. The clean design concept is well balanced between a perfectly organized interior structure and a sleek exterior design. It is complemented by a 4mm see-through-tinted tempered glass panel on the side and addressable RGB illumination surrounding the High density mesh front. The BitFenix ENSO MESH premieres BitFenix new RGB illumination. The addressable RGB lighting allows multiple LED colors in one zone instead of one static color at a time. 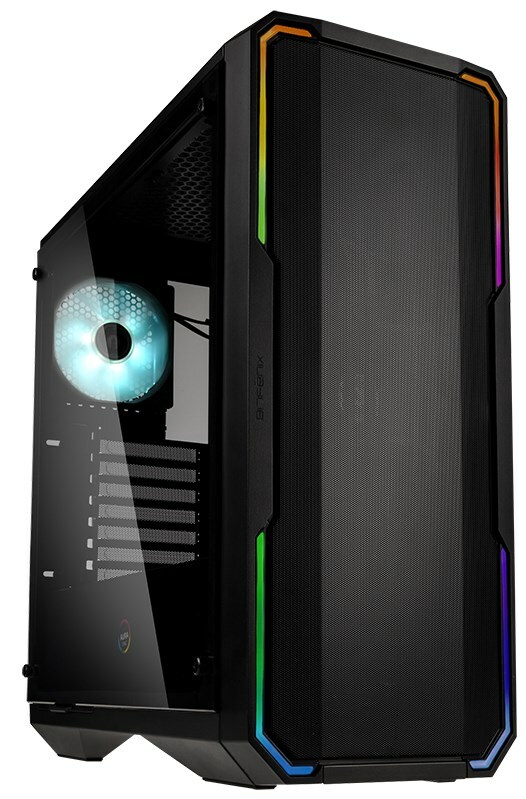 It is powered by a built in controller (compatible to both, BitFenix Alchemy 2.0, static, and BitFenix 3.0, addressable, RGB products ) offering single colors to match different system builds, but also featuring different rainbow modes. The RGB illumination of the ENSO MESH supports the latest ASUS AURA Sync 3 pin addressable RGB motherboards, currently found in high-end segment. It enables users to coordinate multiple color lighting on different devices, including the all new Alchemy 3.0 addressable RGB strip, all controlled and synchronized by the ASUS AURA software bundled with Asus AURA SYNC 3 pin motherboards. The ENSO MESH comes with a high-quality tempered glass side panel with a strength of 4mm. The tempered glass panel is see-through-tinted, allowing a peak into the case showing off the now often RGB illuminated main components. The ENSO MESH comes with a PSU shroud hiding the PSU and up to two HDDs beneath it, while three SSDs can be attached to the back of the motherboard tray, showing only the motherboard, graphics cards and the cooling solution through the tempered glass panel. The 23mm cable management space behind motherboard tray makes it an easy job to manage the cables clean. With the drive-trays out of the way, the ENSO MESH provides plenty of space for graphics cards with a length up to 340mm. To cool down the components, high density mesh on the front panel has offered smooth intake. ENSO MESH supports up to two 140mm fans or a 280mm radiator in the front while a 120mm rear-fan or radiator at the rear and up to two 120mm fans in the top will push the hot air out. ENSO also supports up to 160mm high CPU air cooler. ENSO MESH doesn’t compromise the sleek design of Mesh front panel. The high density mesh has provided over ten thousand holes with magnetic removable function. The clean interior design creates no interference to the air flow blowing straight on GPU that helps not only to cool down the GPU also provide much focus air flow to the GPU. The close and clean PSU shroud keeps ENSO MESH to have two individual chambers. It makes all components will have individual cooling section. And the soft foams complemented with tempered glass lock the noise inside. Bundled with the mesh dust filter offers the extreme cooling performance. To keep the interior of the ENSO MESH dust-free, multiple filters are placed around the case. The front and top filters are attached via magnets and can be easily slid off to clean it. The ENSO MESH also features BitFenix Sideway™-removable PSU filters in the bottom, thus enabling users to remove the PSU filter easily without lifting or moving the case.